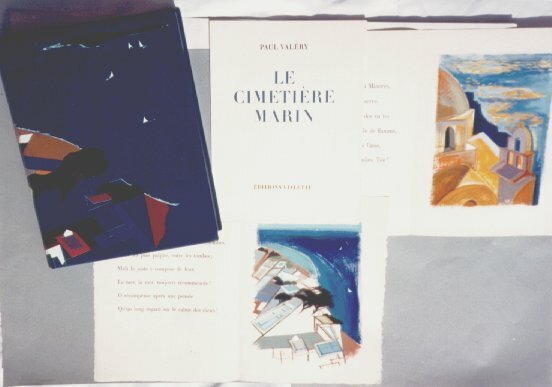 "Le Cimetière Marin" / "Paul VALERY"
Le Cimetière Marin by Paul VALERY, Editions Vialetay. Paris 1965. 50 copies, format quarto Jesus (24x38) of 100 pages embellished with 12 original hand-painted gouches on Arches woven paper by Mireille Berrard. 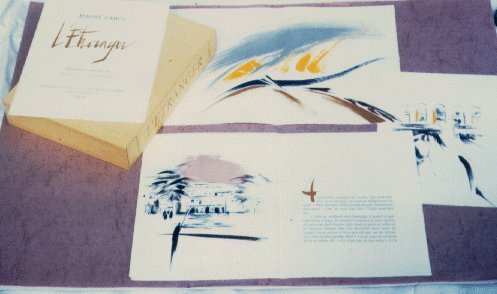 The lay-out is by Henri JONQUIERES and the printer DARAGNES. The 1st copy, bound by Jacques MENIDREY (this edition) is unavailable. Rupture de stock "L'Etranger" / "Albert CAMUS"
L'Etranger by Albert CAMUS, Editions "Les Heures Claires". Paris 1976. 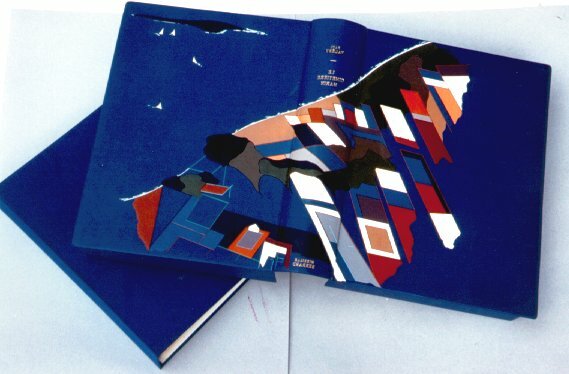 350 copies, format 25x33 of 200 pages embellished with 16 original lithographies, including three double pages by Mireille Berrard - from the Grayholith work-room and printed on Rives woven paper by JACQUET (4 copies available). 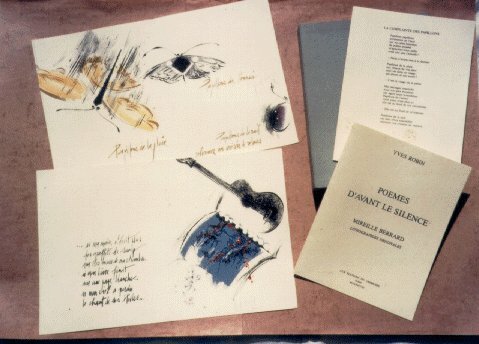 "Poèmes d'Avant Le Silence" / "Yves ROBIN"
Poèmes d'Avant Le Silence by Yves ROBIN, Editions "Le Grimoire". Paris 1988. 200 copies, format 25x33 embellished with 12 original lithographies printed on Arches woven paper by Michel CASSE, Paris (8 copies available). 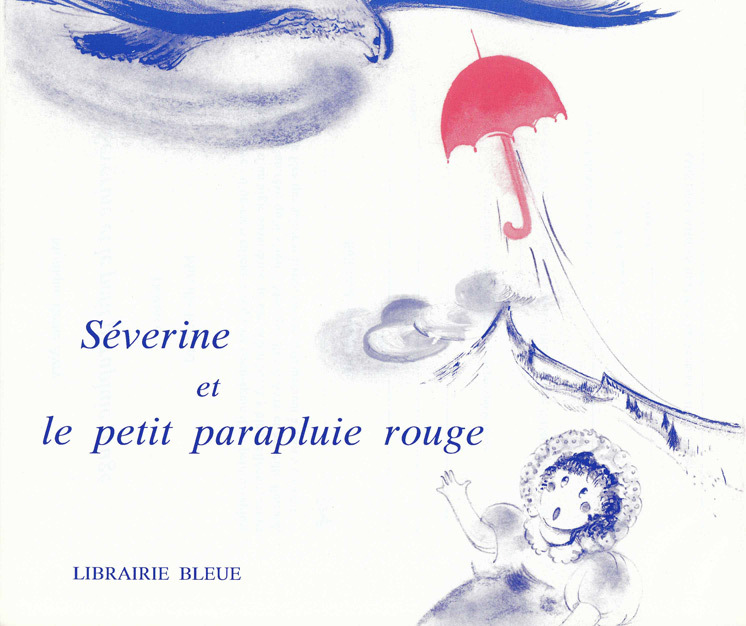 Disponible "Séverine et le petit parapluie rouge" / "Monique Reine-Avry"
Contes pour enfant, Les Éditions "Librairie Bleue". Troyes 1988. 500 ouvrages, format 26x21 cm. "Séverine et le petit parapluie rouge"